Great value and amenities are found at this Hubbard hotel ideal for travels in Northeastern Ohio and midway between Cleveland, Pittsburg and Chicago. 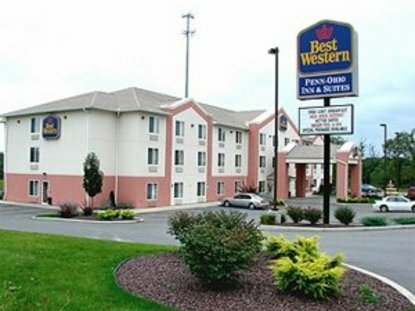 The Best Western Penn-Ohio Inn & Suites is a great setting for vacationers and those traveling on business. All guest rooms are clean, spacious, up-to-date and equipped with free high-speed Internet access. Other amenities include an indoor heated swimming pool, hot tub, continental breakfast and an on-site business center. With easy access to I-80, the hotel is closely connected to Ohio and Pennsylvania area business and retail. Nestled in the middle of the Mahoning and Shenango River Valleys, this Best Western hotel borders communities such as Youngstown, Brookfield and Masury in Ohio and the cities of Hermitage and Sharon in Pennsylvania. Local attractions such as the National Packard Museum or the Grove City Prime Outlets are just minutes from the hotel. Local activities include nature walks, visiting art venues and sightseeing. Golfers will find plenty of opportunities to practice at local driving ranges and famous golf courses. Whether simply driving through or visiting the scenic Pennsylvania/Ohio area, be sure to make an online hotel reservation today and save at the Penn-Ohio Inn & Suites.